Ernest Theodore White was one of nineteen children, born and raised in Chelmsford and Springfield. Having left school he pursued a career as a poulterer and poultry dealer. He married in 1907 and had six children and later worked as a commission agent. He was well-known locally as a billiard player. During the war he served in the army and he was killed in action in August 1917 near Arras. His home was in Regina Road. A brother was killed during the Second World War in a German air raid on Chelmsford. Ernest is commemorated on the Civic Centre Memorial, Chelmsford, it is believed both as ‘Private E. T. White’ and ‘Corporal E. T. White’ of the Essex Regiment. He is also commemorated by the Chelmsford Parish Great War Memorial in Chelmsford Cathedral. He was entitled to the Victory and British War medals. His wife and children moved from Chelmsford to Fulham. London in 1918. The 1918 register of electors listed Ernest’s parents at The Wharf, Springfield. His father died in 1933; his mother likewise in 1937. Ernest’s brother Sidney Victor White was killed in an air raid on Chelmsford in 1941. Ernest’s widow died in London in 1976. He was one of 19 children, three of whom would die before 1911. His siblings included: Henry A. W. White (born c1868 in London), Herbert A. J. White (born c1869 in Baddow), Arthur Alexander White (born in 1871 in Springfield, died in 1928), Louisa Alberta M. White (born in 1873 in Chelmsford), Alice Alma White (born in 1874 in Chelmsford), Albert Walter White (born in 1876 in Chelmsford), Matilda Rosalia B. 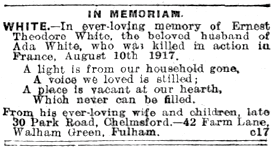 White (born 1877 in Chelmsford, died in 1966), Charles Albert George White (born 1879 in Chelmsford, died in 1954), Henrietta Caroline White (born in 1880 in Chelmsford, died in 1902), Matilda Geraldine Laura White (born 1881 in Chelmsford, died in 1898), Frank Sidney White (born in 1883 in Chelmsford, died in 1950), Florence Nellie White (born in 1885 in Springfield, died in 1961), Maud Elizabeth White (born in 1889 in Springfield), Sidney Victor White (born in 1891 in Springfield, died in 1941), Archibald Edgar L. White (born in 1892 in Springfield, died in 1972), and Dorothy White (born 1896 in Springfield). The 1891 census found Ernest aged two living with the rest of his extremely large family at Springfield Wharf, Springfield. His father and eldest brother were fish poulterers. His sister Alice Alma White was a lady’s help; brother Albert Walter White was a stationer’s assistant. Ten years later the 1901 census found the majority of the family still living at The Wharf, Springfield. Ernest was aged 12. His father Henry Thomas White and Arthur Alexander White were employed as poultry dealers. The registers of electors up to 1911/12 showed Henry Thomas White still at The Wharf. The 1911 census recorded 22 year-old Ernest living with his wife, two children, father-in-law (Daniel Parish) and brother-in-law (Harry Parish) at 17 Regina Road. Ernest was a self-employed poultry dealer. His father-in-law was a labourer on the road and his brother-in-law an operator of a ball machine (presumably at Hoffmann’s ball-bearing factory in Chelmsford). A neighbour at the time, two doors away, was Frederick John Tyler. Ernest lived and enlisted at Chelmsford. He was killed in action on 10th August 1917 while serving as Lance Corporal 201525 in the 2nd Battalion of the Essex Regiment. He is buried at Feuchy British Cemetery, Pas de Calais, France, five kilometres east of Arras (grave: II. D. 14). “Pt. 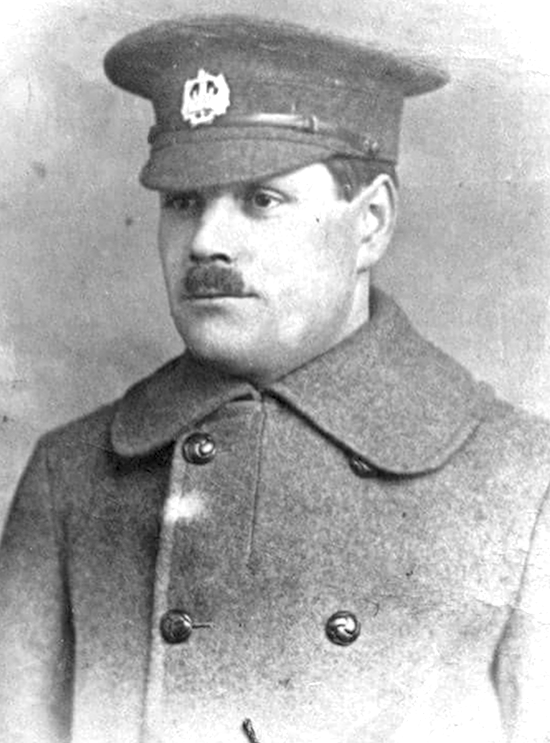 Ernest T. White, Essex Regt., commission agent, Chelmsford, son of Mr. H. T. White, was killed by a shell while going into the trenches. Although the official intimation has not been received, Mr. Geo. Wilkinson, the Chelmsford footballer, one of the original Expeditionary Force, had written to the relatives conveying the sad intelligence. Ernest was born at Springfield in 1888, the son of Henry Thomas White and Susannah White. His father had been born in 1847 in Willingale, his mother c1849 at Great Baddow. The couple had married in London on 5th May 1867. In 1871 the census had recorded them and three sons at The Wharf in Springfield. In 1881 the family had been resident in Myers Yard off Chelmsford’s High Street where Ernest’s father was a poulterer.